Canon 500mm f/4L IS lens with EOS-1D Mark II N. ISO 400. Evaluative Metering +1 stop: 1/125 sec. at f/5.6. Whenever I attempt to make an image of a large, loose group, I choose one bird in the front row and focus on in. Here, the Marbled Godwit (lower right), serves as a compositional anchor. 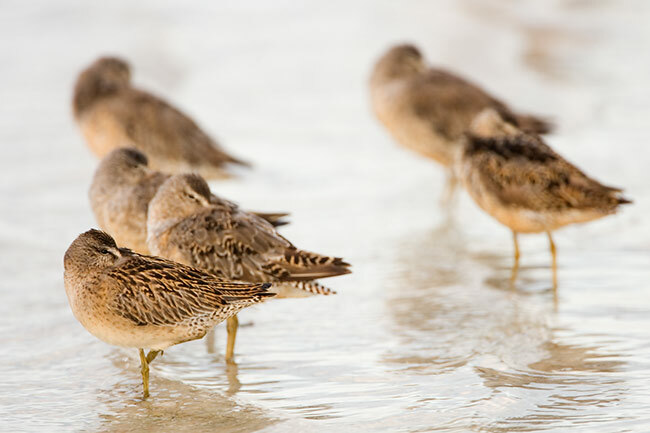 Can you identify each of these additional shorebird species: Willet, Greater Yellowlegs, Black-bellied Plover (both molting adults and winter plumage birds of t his species are present and identifiable…), Western Sandpiper, Sanderling, and Short-billed Dowitcher? 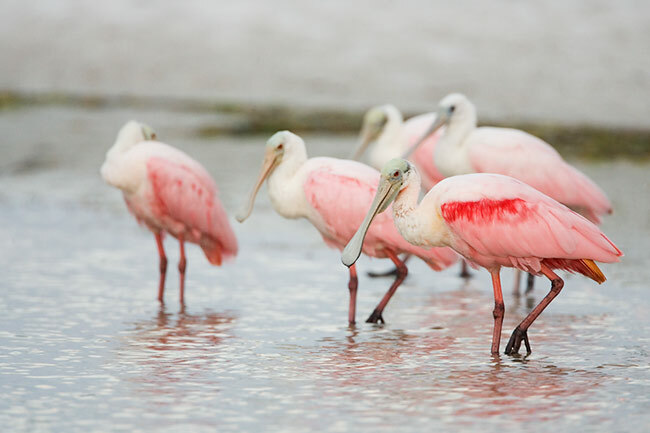 Do you know why they are arriving in Florida in mid-summer? 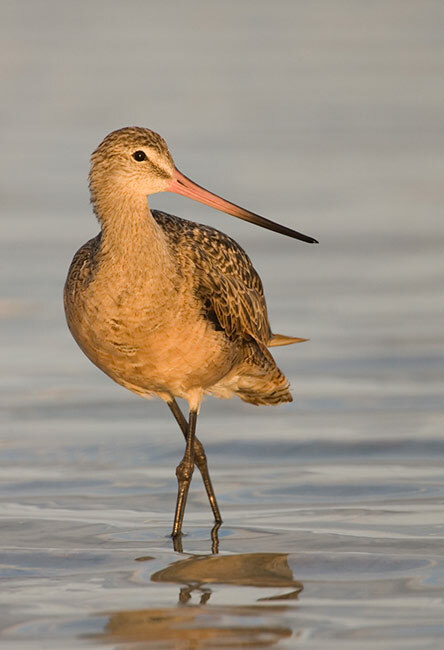 If not, you need a copy of “Shorebirds; Beautiful Beachcombers” ( http://www.birdsasart.com/books.html#SHOREBIRDS ). Contact us by phone at 863-692-0906 (Eastern Time Zone) or by e-mail at birdsasart@att.net or birdsasart@verizon.net. The att address is best from overseas. Canon 500mm f/4L IS lens with 2X II TC and EOS-1D Mark II N. ISO 400. Evaluative Metering +1 stop: 1/400 sec. at f/8. There is a fairly deep new cut at the point at North Beach. Standing in it as the tide dropped served two purposes: 1-being lower, I was less threatening to the birds. 2-though standing at full height, I had a very shallow angle of declination to the birds. You can learn a lot about the angles of declination and inclination, perspective, and proper light, head and body angles in the Advanced Composition and Image Design Chapter in ABP II ( http://www.birdsasart.com/ABPII.htm). Photographic Theme: A few of my favorite images from my Fort DeSoto visit on August 16, 2006. Canon 500mm f/4L IS lens with 2X II TC and EOS-1D Mark II N. ISO 400. Evaluative Metering +2/3 stop: 1/320 sec. at f/8. As regular readers know, when using the 2X TC with an f/4 lens, you are limited to the central sensor only. If I had used AI Servo AF here, the point of focus would have been on the bird’s breast and the eye would not have been sharp. To avoid this, switch from AI Servo to One-Shot AF, focus on the subject’s eye, and recompose to create a sharp, well-balanced composition. Silver Salmon Creek Lodge Bear/Puffin IPT. AUG 8-14, 2007. 5 FULL & 2 HALF-DAYS OF PHOTOGRAPHY: $4,999. (Absolute limit: 12 photographers: only 6 openings left.) Two co-leaders to be announced. I spoke to David Coray a lot during the second week of August. He reported that were as many as 19 bears on the flats right in front of the lodge every day either clamming or catching silver salmon. On this IPT there will be lots of opportunities to photograph Coastal Brown Bear (a large race of grizzly) at fairly close range. The bears of Lake Clark National Park are not hunted and are totally comfortable around humans, just as they are in Katmai National Park. In addition to the bears, we will be concentrating on puffins, especially on Horned Puffin (which is the easier of the two western species to photograph on one of two islands near SSCrL). All of the puffin outings will require a boat ride and a bit of climbing. 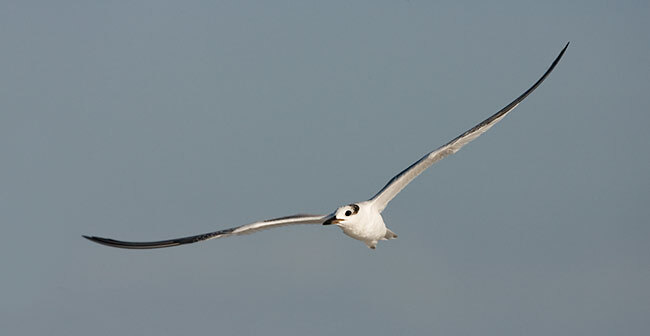 There should be lots of great opportunities to photograph the Horned Puffins in flight. We may try for Tufted Puffin as well but they are much tougher to photograph than the Horned Puffins. There are lots of opportunities for scenic and macro photography as Lake Clark is a beautiful, biologically diverse area. There will be optional fishing trips for both halibut and silver salmon. I will be doing some fishing. Last year I brought home 50 pounds of salmon. The SSCr guides are expert at preparing your catch for travel and/or shipping. Nobody has to fish if they do not want to, and there will always be a competent photography leader for each of our small groups. We will be splitting up into two or three groups on a daily basis. While we will do our very best to ensure that you will be able to do exactly what you want to do each day, there may be an occasion or two when that is not possible. We will be in Alaska, so please be aware that we might encounter some lousy weather. You will need to be in Anchorage on the afternoon of August 7, 2006 to ensure that you will make the float plane on the morning of August 8. The cost of a double-occupancy room for the night of August 7th is included. . You can upgrade to a single room upon payment of a single supplement of approximately $85. (Hotel rooms in Anchorage are extremely expensive in summer.) It would be best if everyone planned to arrive in Anchorage a day early (on August 6th) to allow for any travel delays that might cause you to miss the scheduled float plane convoy (9am on August 8th). Do note that the float plane trips are dependent on decent flying weather. They are delayed at times. If you choose to stay arrive early, the cost of the August 6th room is not included. We will have dinner together at 6pm sharp on the evening of August 7th. Please plan to arrive in Anchorage so that you can make this dinner as we will be doing our introductory slide program then. We will be doing many instructional slide programs and will be able to tailor the programs to the needs of the group. In addition, there will be lots of opportunities for image sharing and critiquing. Don’t be shy; critiquing is the very best way to learn how to make better images. We will be staying in one of the two Silver Salmon Creek lodge buildings (that are just a short walk apart). All of the lodge rooms are double occupancy. There is one room with a king bed that would be ideal for a couple. First couple to make a deposit wins! I am offering a $300 discount for anyone who wishes to stay in one of the two cabins. One cabin is a double, one is a private cabin. Though the cabins are rustic, each has a heater, running water, and electricity. Folks who stay in the cabins will need to make a short walk to the outhouse or to the lodge during the night. They will shower in one of the shared bathrooms in one of the lodge buildings. There is a small possibility that late registrants may need to stay in one of the cabins. A $1,000 non-refundable deposit is required. A second payment of $2,000 will be due December 8, 2006 and the final payment of $1,999 will be due by April 8, 2007. All payments are by check only. Please make your deposit check out to “Arthur Morris” and send it to BIRDS AS ART, PO Box 7245, Indian Lake Estates, FL 33855. Please include your mailing address, your e-mail address, and your day, home, and cell phone #s.
Canon 500mm f/4L IS lens with 1.4X II TC and EOS-1D Mark II N. ISO 800. Evaluative Metering + 1 1//3 stops: 1/80 sec. at f/5.6. Here again we see the advantage of focusing on the nearest bird in a group, provided that that bird is in nice plumage and is so situated as to anchor the composition. The bird with the all-white head behind the main subject is a one-year old. Canon 500mm f/4L IS lens with 2X II TC and EOS-1D Mark II N. ISO 400. Evaluative Metering +1 stop: 1/200 sec. at f/8. When the sun in not out, the evaluative meter is dumb, and you need to add light in order to keep overall light images light. With its warm colors, and the consistent, even pattern of the feathers of the upperparts, this bird is an obvious juvenile. 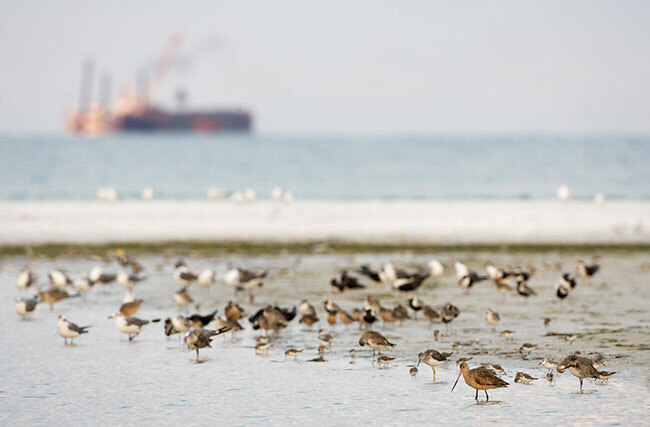 Across the length and breadth of the Americas, about 35 species of shorebirds are winging their way south to the wintering grounds. 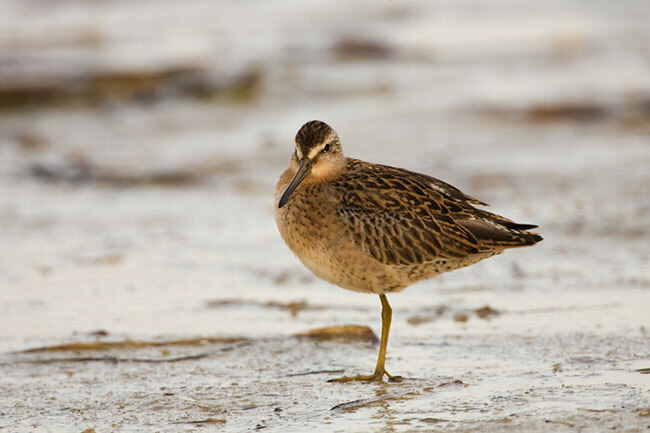 The adults began their trek in early July, and the young birds of the year are just beginning their journey. 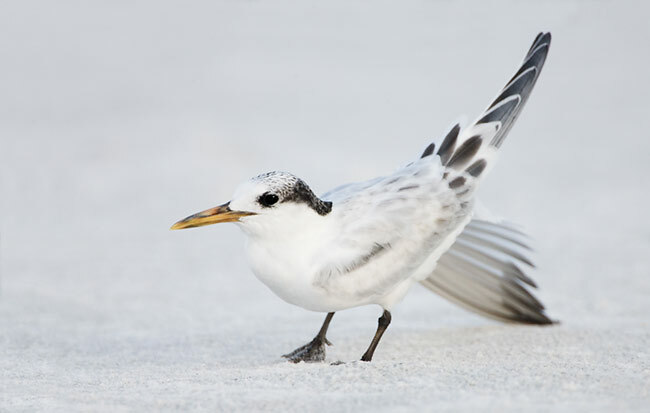 It is the perfect time to get yourself a signed copy of my book, Shorebirds; Beautiful Beachcombers ( http://www.birdsasart.com/books.html#SHOREBIRDS ). With just a bit of study you will learn not only to identify the various species that come thought your area, but to identify them as to their age. (This is actually the easier of those two tasks.) In addition to the tips on aging and identification, Shorebirds has tons of information on the natural history of my favorite birding family. Canon 500mm f/4L IS lens with 1.4X II TC and EOS-1D Mark II N. ISO 400. Evaluative Metering +1 stop: 1/125 sec. at f/5.6. To beat a dead horse: focusing on the nearest bird in a group is generally the best policy. Note the careful framing: when photographing flocks, don’t be sloppy and cut a bird in half with the frame-edge… The bird immediately behind the juvenile (front left) is an adult nearing completion of its molt to winter plumage. The grey feathers are the winter feathers. The right-most bird, also an adult, is just beginning to molt into winter plumage. The Art of Bird Photography II (936 pages on CD only: http://www.birdsasart.com/ABPII.htm) is virtually complete. When I return from Africa I will write the last preface (#4) and finish the work on the CD packaging that has delayed publication far longer than I anticipated. I plan on finishing up no later than mid-October and sending the master CD to the manufacturer for formal production. We should have the CD book in its final form ready to ship no later than November 1, 2006. In the meantime, we have sold ($30 plus a buck shipping) nearly 1000 copies of the pre-publication (in-house) version and have received only rave reviews. If you are anxious to learn all that I have learned about bird photography since the publication of “The Art of Bird Photography; The Complete Guide to Professional Field Techniques” in 1998. ( http://www.birdsasart.com/books.html#PHOTO_BOOK ). The CD book is an all-new continuation of the original (which is now available only in soft cover) and we recommend that folks just getting started in bird photography purchase both as there is almost no overlap in the two books. Thanks for your patience. Canon 500mm f/4L IS lens with 1.4X II TC and EOS-1D Mark II N. ISO 400. Manual Mode: 1/2000 sec. at f/8 verified by histogram check. Flight photography with a big lens on a Wimberley head an effortless pleasure. I have pretty much been sticking with the central sensor only for flight photography.